Roller-skating… no doubt the Americans know a lot about it ! ...judging by the high number of roller-rinks – all the same as in the movies… uh, makes me envious! 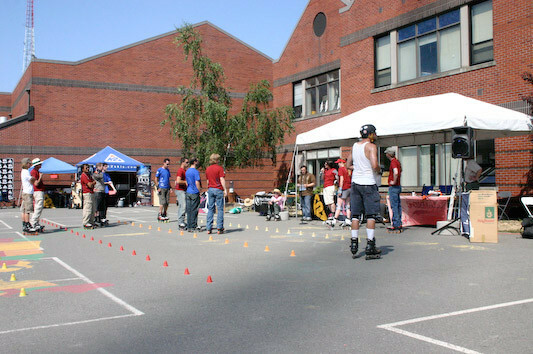 On the other hand, no doubt the Americans also have favourite disciplines: street-skating, roller derby, hockey, funky-dico-roller-dance. And what about freestyle? Hardly heard about that… and what about slalom-skating? 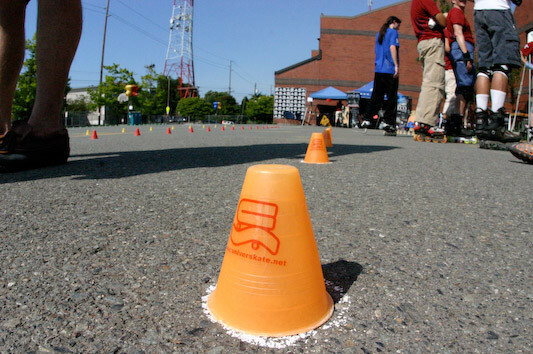 Is it freestyle with – as if happens – cones? How does it work again? Can you eat it? However, a handful of eccentrics (a big dozen at least) scattered here and there on the American territory, found they had a passion for freestyle slalom. The elders have been practising for 3 years, and a few new skaters come and swell the ranks little by little. 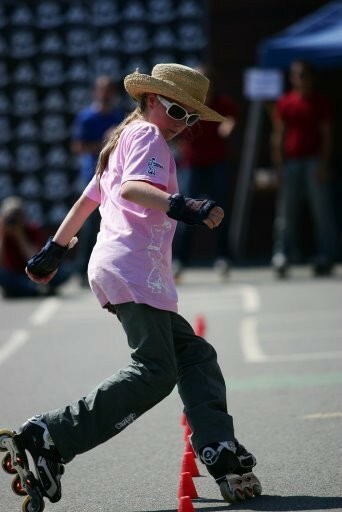 Their motivation commands respect: despite the distance (Seattle is not actually next door to Philadelphia… to give an example), last year they created the USFSA (US Freestyle Skating Association – see freestyleskaters.org). 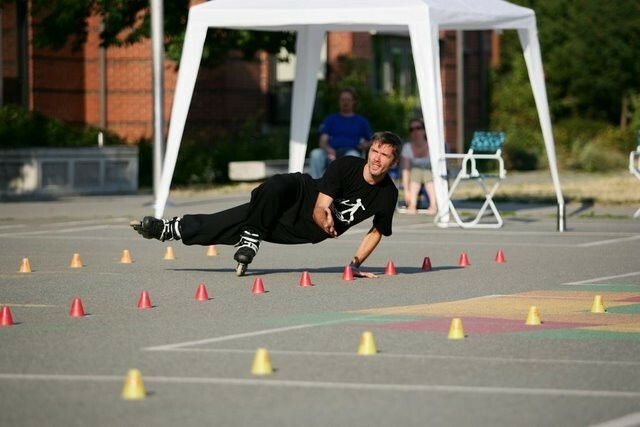 Battle US is the only US freestyle slalom-skating event in the whole year. For the Americans, Battle US is thus the unique meeting, not to be missed. The first edition took place last year in Manhattan (NYC) at Riverbank Skatepark. This year, it was in Seattle, on the 16th and 17th of August, in the playground of an Elementary School. The event was principally concentrated on the first day (Saturday), and Sunday was mostly reserved for workshops. The organisation showed imagination – even more than last year – as for the different challenges and their rules. The program speaks for itself: the contest began with a trick ladder challenge to warm up for the freestyle battles following: national US battle (for US skaters only), and international Battle. The biggest part of Sunday was requisitioned for workshops, and the event ended with a freestyle speed challenge. The public was not actually present (…rather absent, let’s not be afraid of words!) Except the local skaters and their friends, there was nobody. With good reason nevertheless: the public was not their first preoccupation, to quote the discourse of the organisation. Indeed the general level is still weak, and thus not sufficient to captivate the attention of a public who would grow tired too fast. The aim of the event was to enable the skaters to gather and exchange… in order to improve… and in the future to present a good show and make the discipline known. This justification explains the importance of the workshops in the weekend planning. Naomi Grigg (UK) offered workshops during the whole week preceding the event, and Xuan Le (FRA) as well as Pierre Kunneman (GER) took over on Sunday. 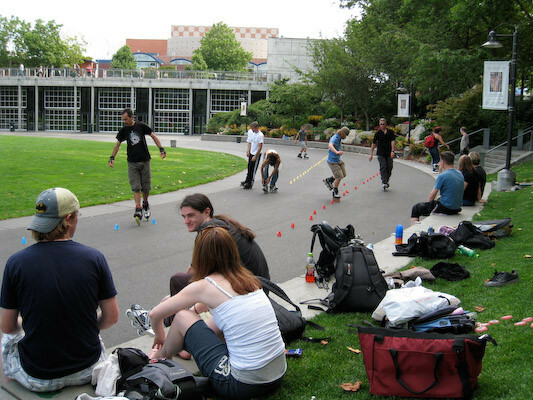 The skaters found themselves all together in a playground for two days, in a very relaxed atmosphere, according to the feedbacks. They were 16, the biggest half being American (9), most of the others having come solo from England, Canada, Australia, Germany, France, and Indonesia. The day before the battle (Friday), all the skaters met for various activities (city tour, skating) to get to know one another a bit before the hostilities start. The Slalom Trick Ladder was a fun warm up for the major events that were following: the freestyle battles… which started just after a little lunch-break – made of donuts, cheeseburgers, and other typical American meals served at the refreshment area… the whole washed down with sodas – or sometimes water for the dissidents. Because of the low numbers, and the US skaters belief in unisex competition, all the challenges were mixed. For the national battle, there was 15 skaters (including 4 girls). The advantage, with a reduced number of skaters, is that you’ve got time to put in place groups with three runs and one last trick for each round (not only for the finals as it is too often the case). The quarter-finals groups were made up by qualification runs. The levels were very uneven (a huge difference between the finalists and the rest), the styles very different. Without surprise, it’s Jeremy LaCivita (Philadelphia, PA – one of the pioneers of freestyle slalom in the US) who wins the national battle. He is followed by Megan McIntosh (Worcester, MA), Dennis Palmer (Chicopee, MA), and Stacy Schlutsmeyer (Seattle, WA). The four finalists showed safe runs, in accord with their constant improvement of the last three years. They have the merit to have started from scratch, and to have taken the time to patiently integrate the basics. “Slowly but surely”, to quote the saying. Let’s mention the participation of Nancy Gallacher (Seattle, WA), the little eleven-year-old mascot of the weekend, who nearly reached the finals… the girl not only participated to all the challenges of the weekend, but she also ranked quite high everywhere! The international freestyle battle followed on: same principal characters, plus the internationals: Naomi Grigg (UK, #5 WSS Women Ranking) who dropped the judge-cap (she judged the national battle) to go and fight with the internationals, Xuan Le (FRA, #5 WSS Men Ranking) and Pierre Kunneman (GER, #25) of the Seba Team, John Stanning (AUS, #196), and Chris Hubick (CAN) the jamskater, to cite only the favourites. This time, the quarter-finals groups were made up following the WSS World Ranking, and qualification runs. No suspense as for the qualifications for the semi-finals. In semi-finals, the first group goes off without incident: Xuan Le and Jeremy LaCivita (winner of the national battle) go through the finals. On the contrary, the second group is much trickier to cope with: Pierre Kunneman qualifies first for the finals, and Naomi Grigg and John Stanning fight for the second place. Each one makes use of their weapons: Naomi always stylish and smooth, against John who counts on more technical stuffs. But despite he tried sevens and wheelings, Naomi plays safe with cleaner and more stylish runs. And Naomi gets the qualification for the finals, ranking second of the group behind Pierre. It’s at this very moment of the summary that it is judicious to unveil the little originality of Battle US rules: during the qualifications, two criteria (technique and style) marked out of 10 in general impression, with (here is the novelty) the style mark being multiplied by 2. 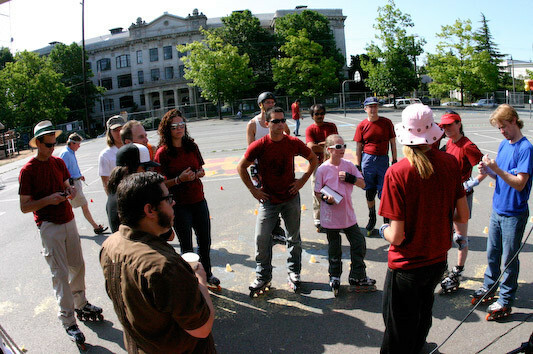 It’s a way to adapt to both the level and the expectations of the skaters. Let’s get back to the final: the group is made up of Xuan Le (FRA), Jeremy LaCivita (USA), Pierre Kunneman (GER), and Naomi Grigg (UK). Xuan, still has his inimitable style, which he fleshes out more and more from one competition to another. He takes the first place – despite a beautiful slow-motion-like fall. Pierre and Naomi remain true to themselves, and respectively rank second and third – let’s note in passing a fluid kasatchoc Kunneman’s style. As for Jeremy, whose skating is not as mastered as that of his opponents, he gets a nice 4th place. On Sunday, the event resumes late in the morning with the freestyle workshops. Two different groups: the first one dedicated to sitting tricks was animated by Pierre Kunneman, the second one devoted to basics and spins by Xuan Le. 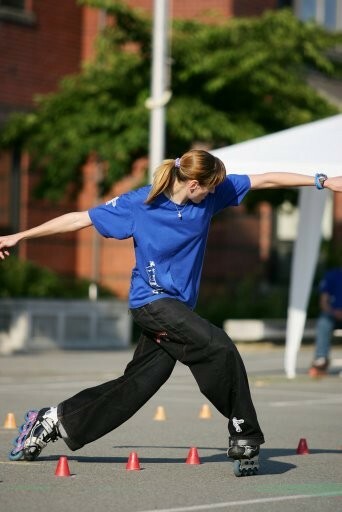 All the skaters took part. And the sessions went on so well that they got late to start the freestyle speed slalom. This is the last novelty of Battle US: speed slalom with compulsory tricks! Everything drawn: two caps, one with the names of the skaters, the other with the name of some basics… you take one basic and two skaters, and they have to confront each other in KO system (one round only) doing the drawn basic. The second subtlety is that it’s a speed challenge, without cells nor chronometer… the first arrived at the end of the line wins if he doesn’t knock over any cones. If he does, he is disqualified and the second wins – provided he has not himself knocked any cones. Otherwise, they must re-do. And to end with a flourish, everybody found themselves at a roller-rink… clubbing the whole Sunday evening!